Chili is such a lovely thing. A lovely, filling, tasty, easy to make thing. We love chili. Although I think you figured that out after reading the last two sentences. Luke loves that it’s packed with protein. I love, well, actually I love everything about chili. Especially the one I am sharing today. All of the ingredients live in my pantry or freezer at all times and I can pull it together without having to plan for it in advance. That right there makes me feel warm and fuzzy and pays off on those days when the family is still looking for a hearty dinner but I just want to make something simple. You know, like last week when I wasn’t feeling so hot and would have rather laid on the couch in my flannel pjs cuddling with a box of tissues than make a big meal. Making a big pot of this chili was the perfect answer. When chili and chicken can come unite as one, Luke is a happy husband. When it is easy to make and I don’t have to work all that hard, I am a happy wife. At least on those under the weather days. 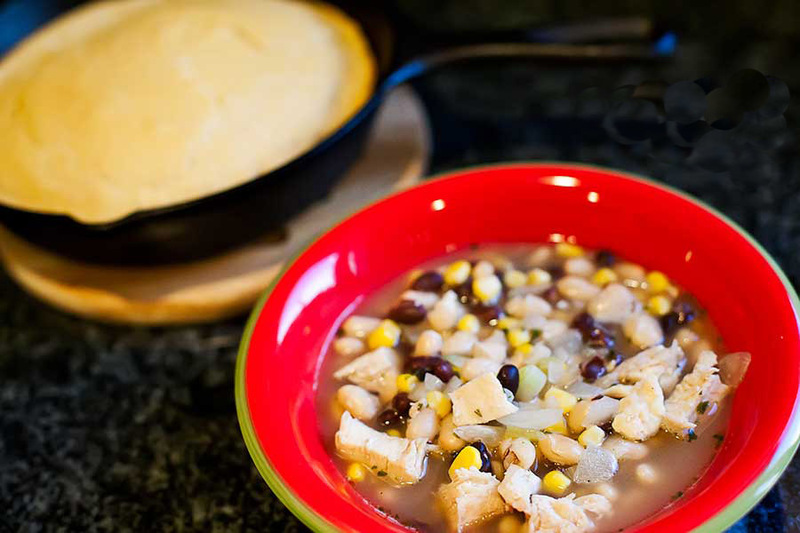 This White Chicken Chili is easy and quick and delicious. I mentioned it’s delicious right? For a chili it is not very spicy. I intended it to be that way. I love spicy chili, I love heat, but Maddy does not and the diced green chilies in this recipe give it just the right amount of flavor without giving it so much spice Maddy won’t eat her dinner. You can easily kick up the spice levels by adding more chilies, chili powder or some hot sauce. I’d recommend serving this up with some fresh cornbread or cornbread muffins still warm from the oven. Cornbread is good. Mmmm, carbs. In a stock pot, warm olive oil over medium heat. Add onion and garlic to pan and saute until onions are soft. Add coriander, oregano, and cumin to pot. Stir and cook mixture until fragrant, about a minute. Pour chicken stock into pan. Add corn, great northern beans, black beans, diced chicken and diced green chilies to pot. Bring to a simmer and cook until chicken and beans are warmed through and flavors have come together, about 10 minutes. Squeeze lime juice into pot, stir to incorporate. What is one of your favorite things to make on those days when you are under the weather or low on energy or time?